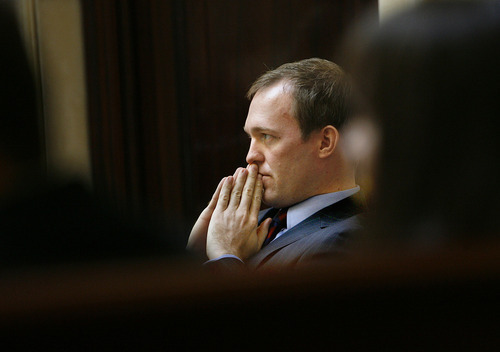 SCOTT SOMMERDORF | The Salt Lake Tribune Sen. Ben McAdams, D-Salt Lake City, listens to the debate as he prepares to try to get his anti-discrimination bill, SB148, out of the Rules Committee, where it has been bottled up without a hearing. The bid to move the bill out for debate failed. SCOTT SOMMERDORF | The Salt Lake Tribune Sen. Ben McAdams, D-Salt Lake City, listens as Sen. Margaret Dayton, R-Orem, explains why she thinks it's proper that his anti-discrimination bill, SB148. stays mired in the Rules Committee that she heads. McAdams tried repeatedly but failed to get the bill released for a public hearing. While polls show the proposal has widespread public support, Dayton said there simply was no legislative support and lawmakers needed to spend their time more productively. 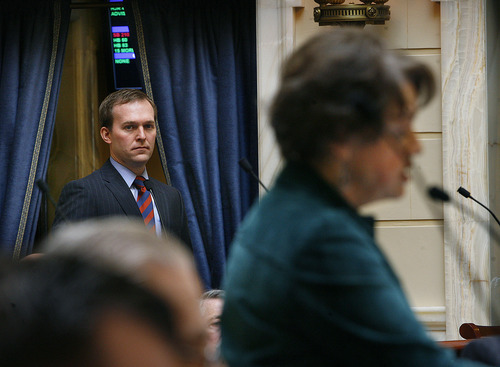 SCOTT SOMMERDORF | The Salt Lake Tribune Sen. Margaret Dayton, R-Orem, listens as Sen. Ben McAdams, D-Salt Lake City, tries to get his anti-discrimination bill, SB148, lifted from the Rules Committee that Dayton heads. The bid to put the bill out for public hearing failed. 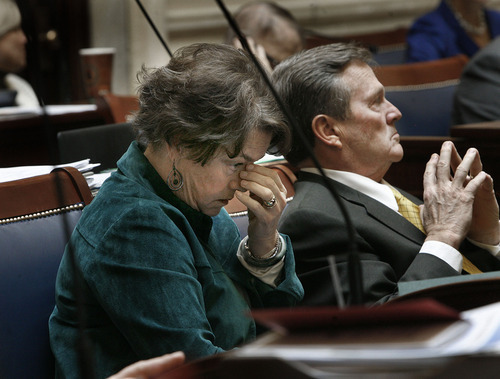 A bid to force a Senate committee hearing on a bill intended to protect gay and transgender Utahns from employment and housing discrimination failed on a party-line vote Monday. Sen. Ben McAdams, D-Salt Lake City, tried the procedural move to force the hearing after it had been blocked in the Senate Rules Committee for more than three weeks. McAdams said there is discrimination occurring and the consideration of SB148 would give gay and transgender Utahns hope and assurance the law will protect them. "Some of you may worry about the controversy and hateful e-mails you might receive," McAdams said. "I believe the dialogue will be respectful and it will be constructive. … I refuse to accept that religious liberty is incompatible with protection of gay and transgender people in their home and on the job." But Rules Committee Chairwoman Margaret Dayton, R-Orem, said that with 1,200 bill requests filed, not every one gets a hearing and McAdams shouldn't get special treatment. Sen. Chris Buttars, R-West Jordan, said he doesn't believe there's a problem that McAdams' bill would solve. "I don't know why we try to press these things out like this when there isn't a demand for it," Buttars said. McAdams' effort failed 21-7 on a party-line vote. "There are reasons there should be exceptions to" anti-discrimination ordinances, said Senate President Michael Waddoups, R-Taylorsville, who is a property manager. "A person who owns a duplex, for religious reasons, may not want to have someone in the other half of their duplex." Pressed on what those reasons might be, Waddoups said he was only repeating what constituents had told him. Waddoups said McAdams should thank the Senate for not allowing his bill to have a hearing, because he believes that the body could have rolled back the 11 community ordinances. McAdams said he would still try to get a hearing for his bill but recognizes the chances of that happening this year are slim.